You sent such nice comments on the needle “secret code” information we posted on Wednesday, we thought you might like more info on needles and thread. Here are a few of our favorite on-line resources on sewing machine needles. Enjoy! 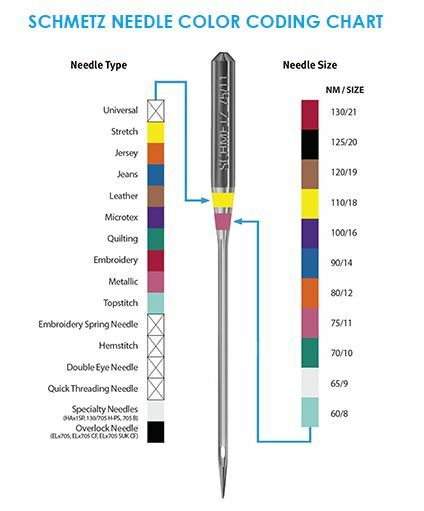 Also from Schmetz, an awesome Needle Primer with all the info you need to know about selecting the right needle for the fabric and thread you’re using for your project. Would you like to actually see the differences between needle types? Check out Sewing Machine Needles: An Overview on the Threads magazine website. Very nice photos and descriptions of each needle type and its uses, plus helpful trouble-shooting tips. From the Threads website Teach Yourself to Sew Series, Machine-Needle Know-How is a super article on sewing machine needle anatomy and what each part is designed to do, plus a great illustration of how the needle works with the bobbin to create a stitch. Next Next post: Pin It For A Chance To Win The BERNINA 530 Swiss Edition! Thank you so much for this chart. I’ve just printed it off. I will put it in a sheet protector for future use. This is very useful for me. Thanks again.